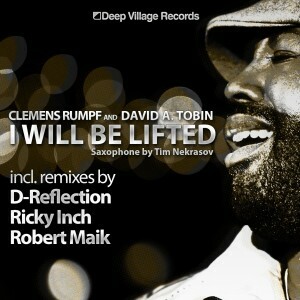 Deep Village Records returns with a new release in 2012 – “I will be lifted”, a rich blend of soulful grooves, vocals and lyrics by Singer and Songwriter David A. Tobin. “I will be lifted” is destined for a long life on the dance floor as well as mix show favourite and potential radio appeal. “I will be lifted” will undoubtedly be another eternal classic from Deep Village Records. Encompassing the production prowess of none other than Clemens Rumpf, Deep Village Records offers a well rounded musical package. Fantastic deep-, soulful-, r&b and a big room house make this package the prefect way to start your 2012. Underpinned by D-Reflection’s (Jacked Dub Edit), Ricky Inch’s (Soulgroove Edit) and Robert Maik’s (Deep Town Edit), offering their own musical reincarnation it’s sure to be a landmark mix for his growing international fan base. His brings a fresh ear to the world of music. D-Reflection needs no introduction. Recognised by a lot of international dj’s and producers with his undeniable passion for everything that has to do with soulful, funky and warm quality house music. This mix will be at the moment the music world sees he may be young but has his ear in 2045! Riho Ints, a.k.a. Ricky Inch played records for the past decade, his music background and knowledge with instruments makes his soulful edit timeless. The talent of a DJ and musician takes this Remix Edit to an international classic. Robert Maik a very talented producer from Switzerland – with several remixes on Purple Music – gives “I will be lifted” his own taste in Deephouse. The vibe is deep and wicked! The roots are 1000 miles down in the earth for this mix. This is a new cornerstone in the temple of Deephouse!